The New Sole E55 Elliptical Trainer 2016 offers all the benefits and features of the E95 but in a smaller more compact design. 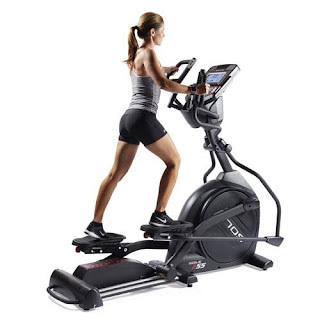 The Sole E55 Elliptical Trainer utilizes a front-drive system, combining a heavy-duty 20 lb flywheel with a high gear ratio and ECB magnetic resistance to bring you a whisper-quiet elliptical machine that provides a fluid and natural motion, which can function in both forward and reverse. 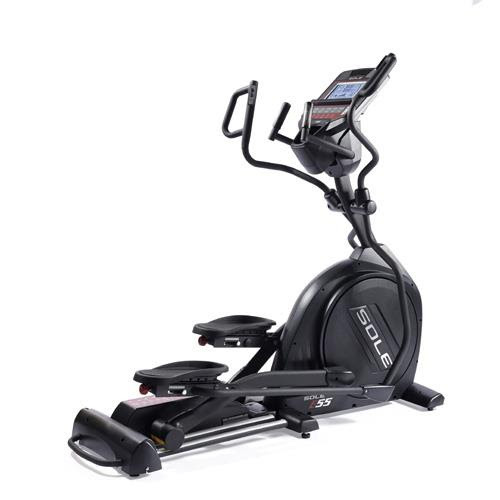 Unique to Sole ellipticals, the E55 features a Power Incline (with fully adjustable ramp angle from 0-20 levels of incline) which helps to work more muscles in the lower body than traditional elliptical trainers and provides additional resistance and more diversity all at the simple touch of a button. The Sole E55 Elliptical Trainer features dual-action handlebars – hold onto the static handlebars to isolate lower body movement or use the moving handlebars to work the upper and lower body at the same time. 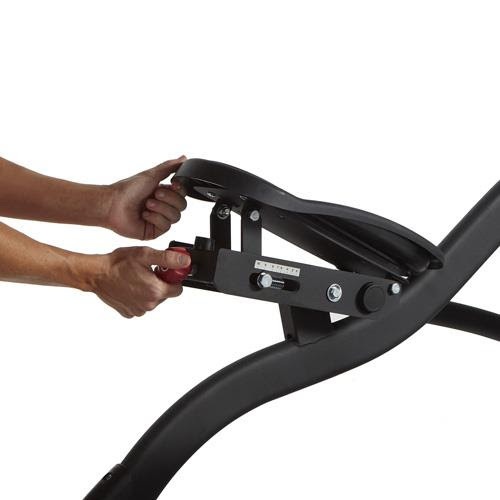 The moving handlebars offer multi-position grips (which the old model didn't have) and Quick Keys for adjusting the incline and resistance levels. The New Sole E55 Elliptical Trainer 2016 comes with an easy-to-use console with a large 9” blue backlit LCD display that shows motivating workout stats including time, speed, distance, calories and heart rate. Your heart-rate is measured via the built-in pulse grips in the static handlebars or via compatible heart-rate chest strap (included). There are 10 workout programs to help keep your workouts varied and challenging including 6 standard, 2 custom and 2 heart-rate programs. New for 2016, the Sole E55 now includes Bluetooth Technology so you can transfer your workout data from the elliptical machine to your own smart device and track your fitness data on the free Sole app or other fitness apps such as Fitbit, Record, Mapmyrun, or Apple Health. The Sole E55’s console comes with advanced features such as a sound system with built-in speakers and MP3/iPod compatibility. There’s also a cooling fan and water bottle holder for convenience. The console itself is adjustable so you can get the best viewing angle no matter what your height is. The Sole E55 Elliptical Trainer 2016 offers a maximum 20” stride length and adjustable foot pedals for maximum comfort. The over-sized foot pedals have been uniquely designed with a 2 degree inward cant to help reduce ankle and knee stress commonly associated with other elliptical machines. The angle of the foot pedals on the Sole E55 is also adjustable to fit the way you walk as not everyone walks the same way – simply adjust the dial on the foot pedal to find the best angle for you – this feature helps to reduce numb toe effects and sore Achilles tendons that are commonly associated with other elliptical machines. Side-to-side foot pedal motion is also reduce on the Sole E55 Elliptical thanks to its 4 rear wheels on heavy-duty rails which provide a more stable and smoother ride. 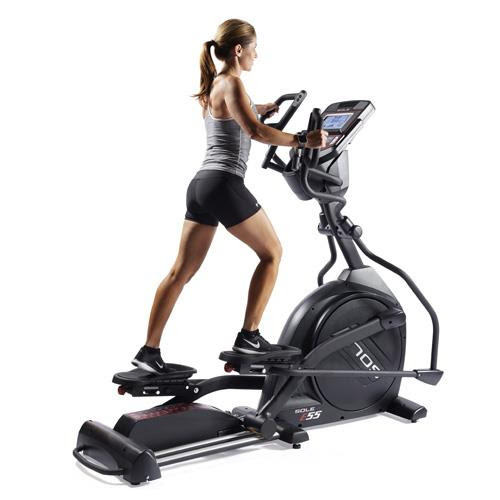 The New Sole E55 Elliptical Trainer 2016 is solidly built with a heavy thick steel frame, providing a maximum user weight capacity of up to 375 lbs. For peace of mind, the Sole E55 comes with a lifetime warranty on the frame, 5 years on electronics/parts and 2 years labor. Fitness tip: Working out for just 30 minutes on an elliptical trainer could burn approx. 310 calories for women or 378 calories for men, depending on the intensity of your workout. 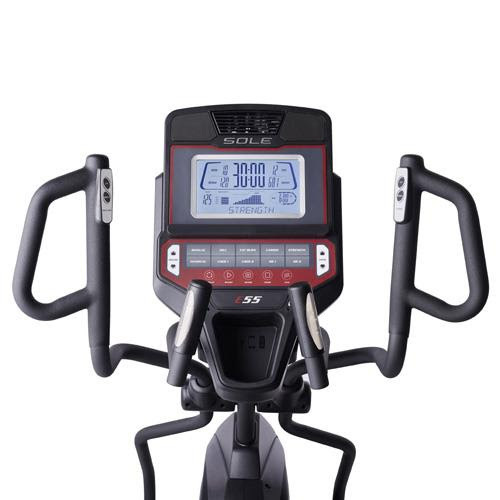 The New Sole E55 Elliptical Trainer 2016 has all the features of a health club machine but in a more compact size – ideal for serious athletes who haven’t got the space for a larger machine. 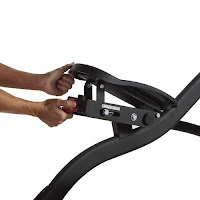 You’ll love the Power Adjustable Incline - a feature that is not normally found on elliptical trainers – allowing you to work more muscle groups than any other elliptical machine. The Sole E55 is built to give you an intensive yet low-impact workout that’s kinder to your knees, ankles and joints over many other types of exercise. With lots of user customizable features, the Sole E55 is ideal for users of different heights/shapes, allowing for a comfortable workout.